These simple Thanksgiving ideas for kids will keep them busy and feeling special so you have more time to visit and socialize with your extended family. 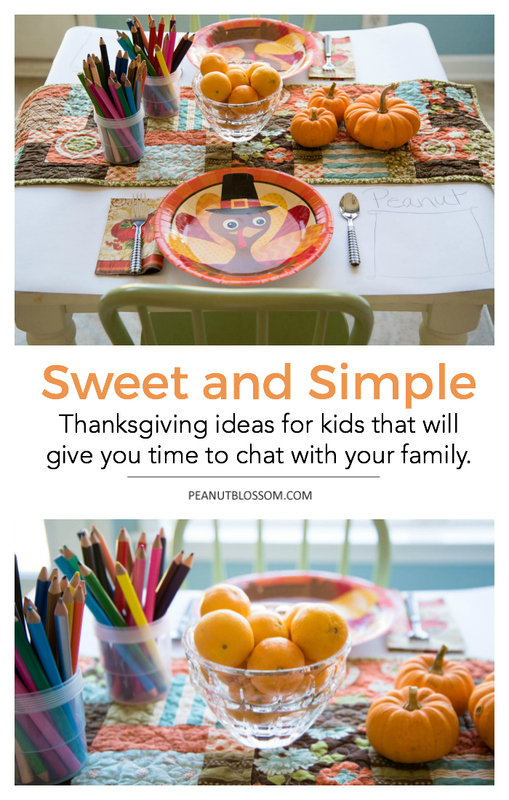 Make the day memorable with a sweet Thanksgiving kids’ table and easy activities to keep them entertained. Check out our Reader’s Favorite Thanksgiving Ideas here. When your house is bursting at the seams with a large gathering of family for Thanksgiving, it’s handy to have some simple tricks up your sleeve for making the day special for your kids. The best Thanksgiving ideas for kids don’t take too much time or effort but will buy you more time for peacefully visiting with your family. With a tiny bit of preparation, these super simple tricks show your kids you’ve thought of them, too. No fancy dishes here! Set their places with cute and colorful paper party ware so they can simply relax and not worry about breaking anything important. It just takes a few simple touches to make the kids’ table a place they’ll be excited to sit. I took 2 seconds to hand-draw little framed squares with their name at each child’s setting and encouraged them to draw Turkey Hands right on the table paper. Once they got going, they loved coloring all over the rest of the paper covering. The white paper rolls we used here. A fantastic set of colored pencils here. For the kids’ table, flowers are too fussy. They can be knocked over and spilled. Instead, go with a monochromatic theme and find orange objects to place in bowls or sprinkle on the table. I grabbed a bunch of clementines from our fridge and put them in a pretty bowl and lined up a bunch of mini orange pumpkins the kids were welcome to touch and play with. 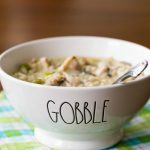 Easy printable Thanksgiving games: Caravan Shoppe has an adorable set of printable Thanksgiving games for kids. The Grateful Kiddies pack includes a word search, bingo game, memory game, and more. GIANT printable coloring Thanksgiving poster: You need to check out this ginormous coloring poster for Thanksgiving! We did the Christmas version of this last year and my kids loved it! We taped it to the living room wall and the kids were welcome to “color on the wall” all season long! Create a DIY Thankful bunting: One part activity, one part decoration. 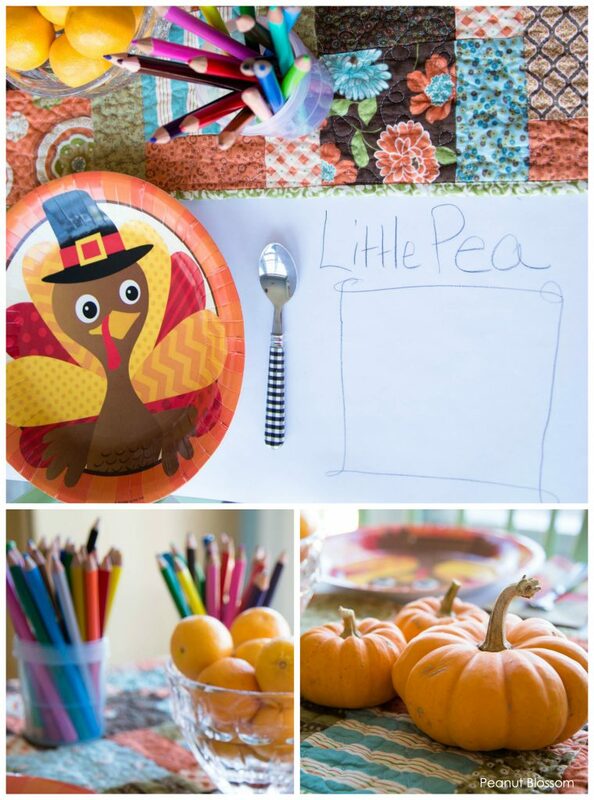 This awesome Thanksgiving bunting would be a lovely activity to set up for the kids while you visit with your family. 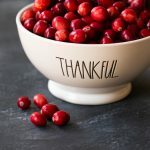 A Thankful heart activity: For the older kids who can write on their own, this lovely thankful heart activity has them counting their blessings. 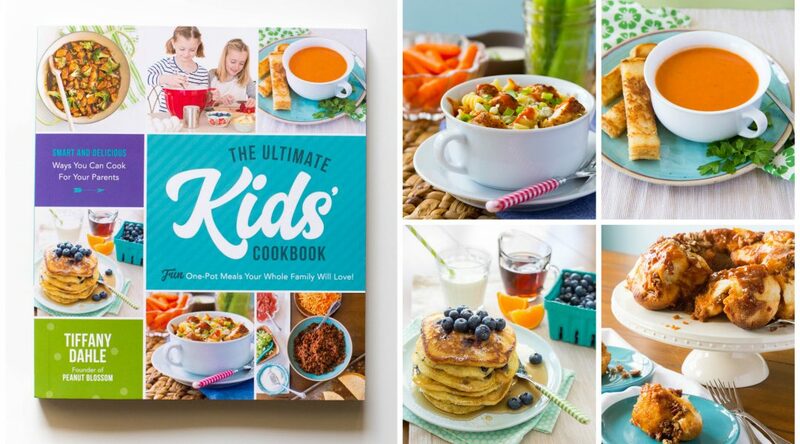 Have the kids share their list over dinner! We all know that the heart of the holiday happens in the kitchen. Set your kids up with one of these 5 easy Thanksgiving recipes for kids and they’ll be so focused on their project you’ll have even more time to chat with your family. And quick, before you go . . .
Like to celebrate? Get on the list! !